Winter is finally here in typically mild, mellow Northern Cal. Foggy, damp nights and chilly mornings make for cozy breakfasts in those fluffy robes and Ugg slippers that have been stuffed in the back of the closet for ten months of the calendar year. The Brit in me comes out in full force at this time of year. Must be the first sniff of rain which sends me straight over to the pantry in search of that epic jar of endless Marmite! Raising three American born sons, I can hear your cry of outrage before it has even so much as touched the hemisphere. "Oeoughhh, yuk, how could you?" Something along those lines and generally followed up by "The Australians are just as bad with their Veggimite!" 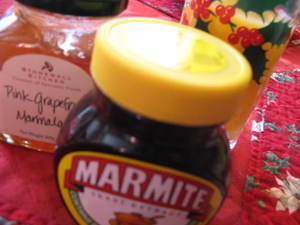 I make no apologies, but guess you have to be born in the commonwealth somewhere (do Canadians eat Marmite? Answers, please!) to have been inducted at a tender age to the merits and taste of this uniquely eccentric Great British food. Poached eggs on crumpets are just not complete without a thin spread of Marmite - which provides the perfect kick to an easy cooked breakfast on a drizzly late December Sunday. In defense of the mighty Marmite product, I am linking you dear reader to the official Marmite website, so that you can see how versatile a spread this truly is: http://www.marmite.co.uk. And my personal favorite (as I am sure you are keen to learn) has to be the ploughman's sarnie of sliced French bread with a slather of Marmite, grated cheddar cheese, thinly sliced spring onions, and lettuce. After all the festive fancy foods, there's really nothing nicer. Think I'd rather have the pink grapefruit marmalade!